Santa Cruz La Laguna is a small town set along the northern shores of Lake Atitlán. 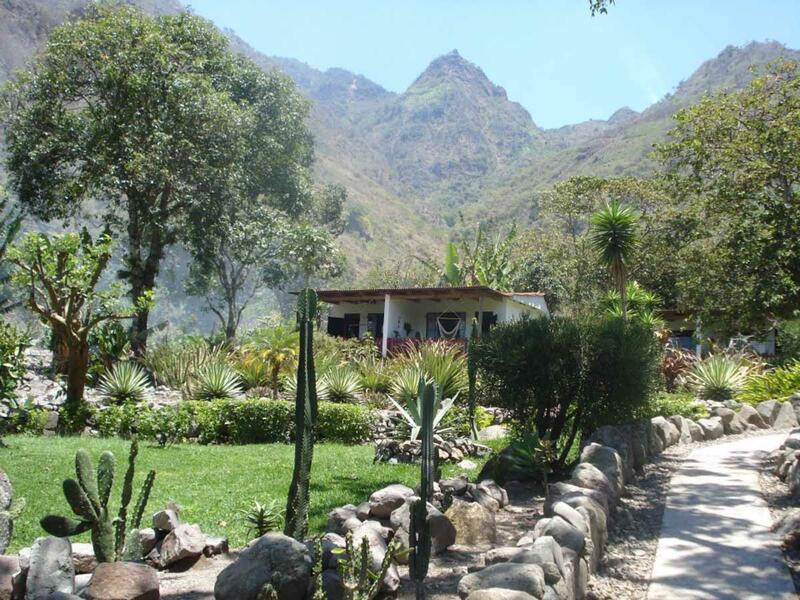 The Vulcano Lodge is actually closer to the smaller town of Jaibalito, but the activities and attractions are virtually the same in both places. The area is secluded and only accessible by boat—this gives it a relaxed feel. The hills behind town are thickly forested and the lake’s water is blue and beautiful. Activities include swimming, kayaking, and hiking. Relaxing with a book or a nap in a hammock is also popular with many travelers. The Vulcano Lodge is set in a privileged location that overlooks Lake Atitlán and the distant volcanoes that border the lake. As a guest, you’ll wake up to this view and enjoy it throughout the course of the day. It’s hard to get sick of. Paths wind through the hotel’s ample garden, which grows bananas, avocados, coffee and more. The tropical plants and flowers give the hotel a peaceful vibe. Guests can access the lake via a wooden dock—this is a nice place to jump into the water or sit and ponder the view. The eight rooms are tidy and tastefully decorated with Guatemalan themes. The private bathrooms have hot water showers and are decorated with natural murals. Glass doors open onto large covered porches that are set with hammocks, couches and chairs—from here, you can look out onto the gardens and distant volcanoes. The rooms are clean, comfortable and homey. The Vulcano Lodge has a restaurant that serves tasty food made with local organic produce. Everything from breakfast to dinner is offered. The five-course dinners are served family-style around a long table, which gives guests an opportunity to chat and swap stories with other travelers. The chefs are happy to accommodate special dietary requirements.